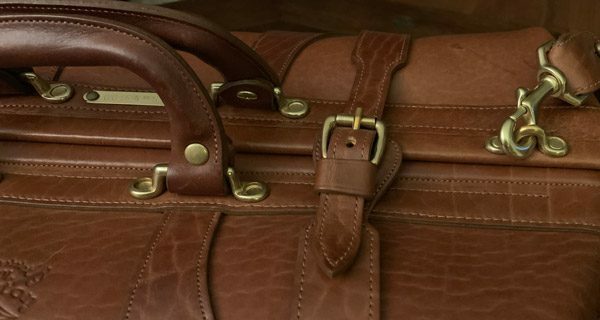 REVIEW – Over the years, I have reviewed more than my fair share of Colonel Littleton gear…and when I say gear I mean some of the finest leather bags and accessories available today. The Colonel’s designs are truly timeless; with quality, materials, and craftsmanship second to none and meant to last a lifetime. For this review, Colonel Littleton sent me their recently released No. 5 Leather Travel Grip Bag to see if this new design lives up to the long line of premium products that came before. I often think that I should have been born in an earlier time. Back when the world was a simpler place, a person’s word/handshake was their bond, people made things with their hands, doors were left unlocked etc. The Colonel Littleton gear I have had the fortune to review is truly the embodiment of those long lost days. Now do not get me wrong, I do love tech-toys. But the modern day gadgets we drool over are definitely fleeting things, designed to be regularly replaced by the next shiny smart-device that tempts our fancy. But in true Colonel Littleton style, the No.1 Grip is created to last a lifetime and designed to be your companion on the road less traveled. This goes for all of the Colonel’s gear, including the No.5 Grip and specifically my Colonel Littleton No. 1943 Navigator bag that is still going strong, used daily for many years and having traveled 10,000’s of miles along the way. 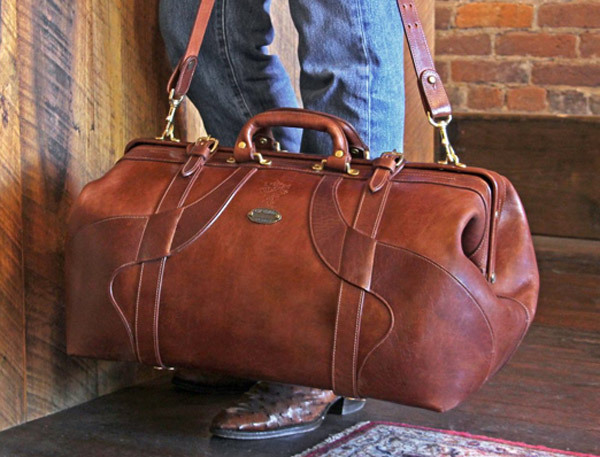 The No.5 Grip is a handcrafted travel bag created in American buffalo leather. 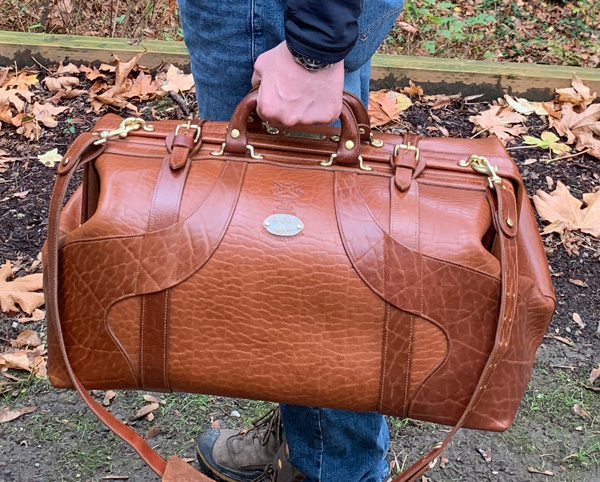 The term “grip” comes from the 18th and 19th centuries for a personal carry bag meant to take with you on a train or stagecoach. A grip was not a bag you checked to the baggage car or entrusted to the care of someone else. It was a piece of luggage meant to be kept with you at all times. Made in the Col. Littleton Workshop of thick buffalo hide and detailed with unique, sweeping, “curvilinear” styling, the No. 5 Grip is definitely distinctive, eye-catching, and will get many admiring looks and comments as you travel the world. From a functional perspective, the No.5 Grip is a large void you can pack a lot of clothes and travel gear in. 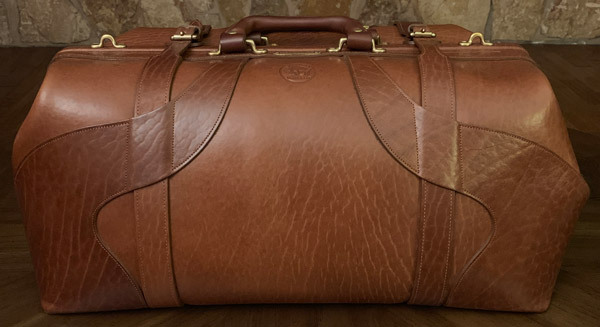 It is the largest, boldest bag in the Colonel’s Grip collection. Measuring in at 12.5″(h) x 20.5″ (w) x 9″ (d) and weighing in at a healthy 7 lbs, this is not a small nor lightweight bag by any means. With 2-3 days of clothes, some workout gear, shoes, shave kit, etc: total weight is near 15 pounds. 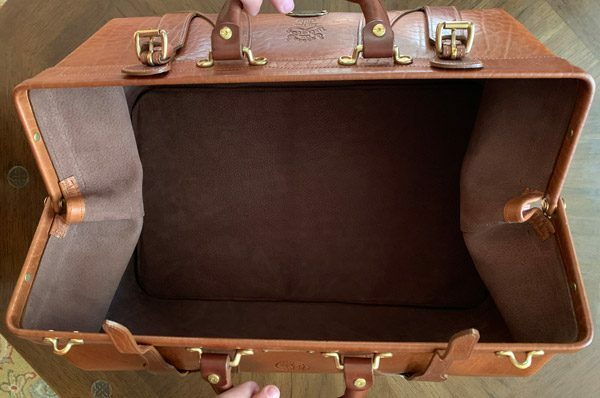 It is carry-on sized for most airlines and should not have to be checked. I love buffalo leather and prefer it over all others. As a bit of my backstory, my father was a buffalo rancher and raised them for decades. In my 20’s, I helped him build several buffalo ranches from scratch and fondly remember the insane amount work that was…let’s just say it involved telephone poles, countless bags of concrete, and a good amount of Motrin. But I digress, the No. 5 Grip is no simple bag; its quality, design, fashion, and hardened durability are apparent the moment you see it. 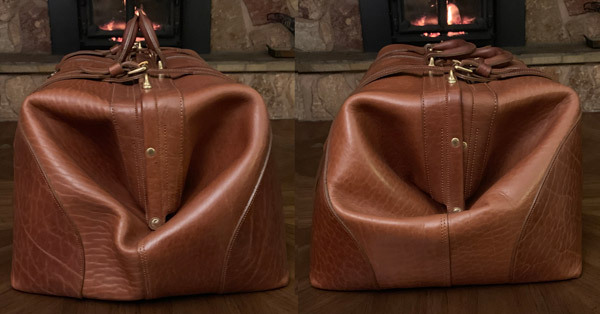 Its sweeping, curved lines not only add to its unique beauty but add durability and strength to the sides and corners of the bag. The American buffalo leather the Colonel uses is thick and rugged but supple and gorgeous as well. The Colonel reinforces all the edges, corners, and hard-points with double stitching and multiple layers of buffalo leather. The hard-points are held in place with solid brass hardware and rivets. Here you can see the sides and how the leather comes together to reinforce the edges and corners. The opening mechanism is hinged like a large medical bag from back in the day when doctors use to make house-calls. There is a brass rivet/bolt on either side of the bag that acts as pivot points for the framework to open. There are additional rivets along the frame to securely attach the leather bag to the mechanism. 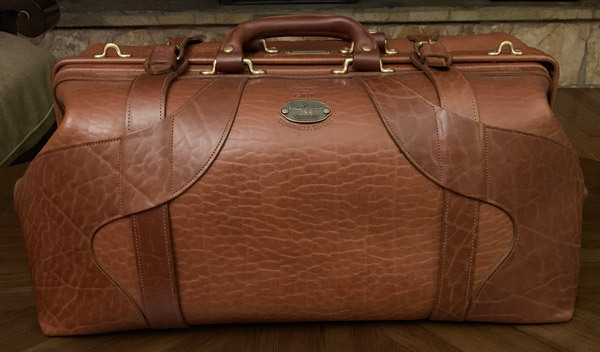 The interior of this bag is fully lined in soft, yet durable pigskin. As I said, it is a pretty big void; where the No.1 Grip could carry a weekends worth of clothes, the No.5 Grip can carry a couple’s gear for a weekend or 3-4 days worth for a single individual. The No.5 Grip has leather straps that encircle the exterior of the bag with buckles on either side of the handles that ensure it remains securely closed. 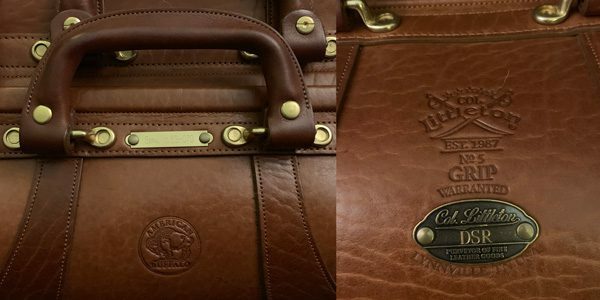 In addition to great design, quality and craftsmanship, there are several very nice touches that add to the bag’s uniqueness including the Colonel’s logo and American buffalo leather moniker stamped into either side of the bag and individual serial number engraved into a small brass plaque riveted into the leather between the handles. You can also have your initials engraved on the oval plate on the front of the bag. The No. 5 Grip has brass “feet” on the bottom of the bag to protect the leather from wear. Instead of the classic rounded knobs that you find on countless other bags, the Colonel uses his engraved forked, metal hard points that in addition to acting as feet, strengthen those locations as well. 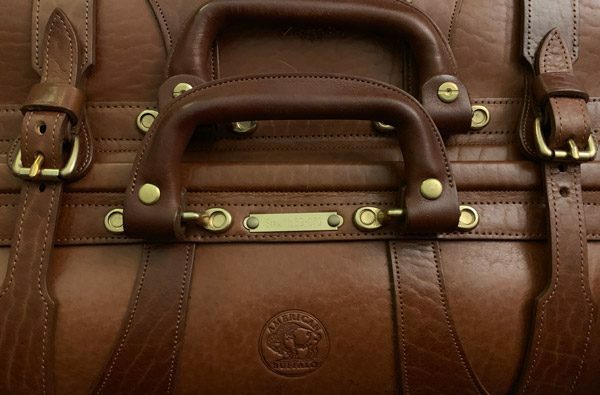 Even with the brass feet, I doubt I will ever set this bag on any rough or dirty surfaces in fear of marring/damaging/staining the leather. The handles are covered in leather and are well formed and comfortable to hold. The removable strap is adjustable and made from the same leather and brass as the bag. The strap rides comfortably on the shoulder but the already hefty leather bag does get a bit heavy when full. Though overall, it is more than manageable. The No. 5 Grip is a gorgeous, old-world travel bag made from thick, durable American buffalo leather by Colonel Littleton’s meticulous craftsmen. 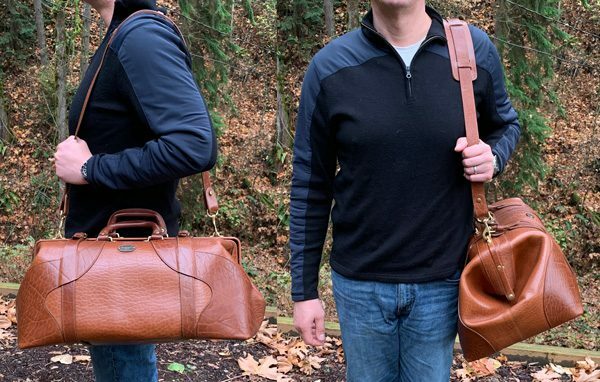 A bag meant to toss into the trunk of your roadster before heading out to the country for the weekend. That said, I know many of you are thinking…OMG that thing is outrageously expensive. I grant you the No. 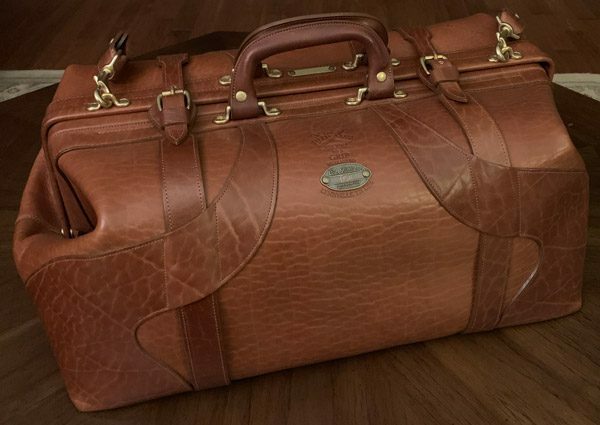 5 Grip is a pricey piece of luggage but none of Colonel Littleton’s gear is cheap, neither in quality nor cost. Bottom line, you get what you pay for. This bag is meant to last decades, if not a lifetime. I know there are high end, luxury brands that sell bags for similar money that last mere years of moderate use. The No. 5 Grip is simple, functional, timeless…that will last 10/20/30 times what your current smart device will for about the same cost. Where to buy: The No. 5 Travel Grip Bag is available on colonellittleton.com. Source: The sample of this product was provided by Colonel Littleton.